Hello Nosh Show listeners! Episode 42 is alive and well and awaiting your listen. We forgo "let's chew on this" in favor of a double sized helping of Nosh or Not. We also recap Marvo's runt-filled Halloween failings and everyone's apparent love of Reeses... or money, we had a bit of trouble agreeing on exactly why Ryan got almost half of your votes. 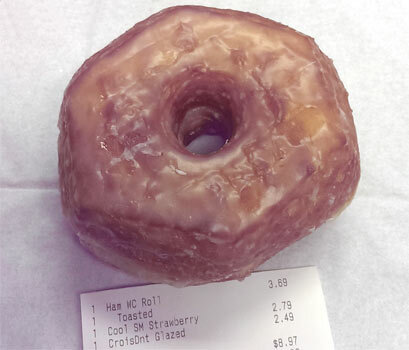 Since followup was a bit light this week, we took a minute to discuss the new overpriced Croissant Donut from Dunkin Donuts. While it's not a bad product, it's plenty tasty enough, it just reminds me way too much of the larger and cheaper DD coffee roll that I adore (it's a giant glazed cinnamon roll basically). Feel free to try this faux cronut once, but after that, try the coffee roll and you'll see what I mean. You can also check out second opinions at GrubGrade and The Impulsive Buy. They call the DD cinnamon roll a "Coffee Roll" and it's my fav donut also Dubba! thanks! I knew I was calling it the wrong thing! Dubba, I found this donut and ate it and it tastes exactly like a hot Krispy Kreme!